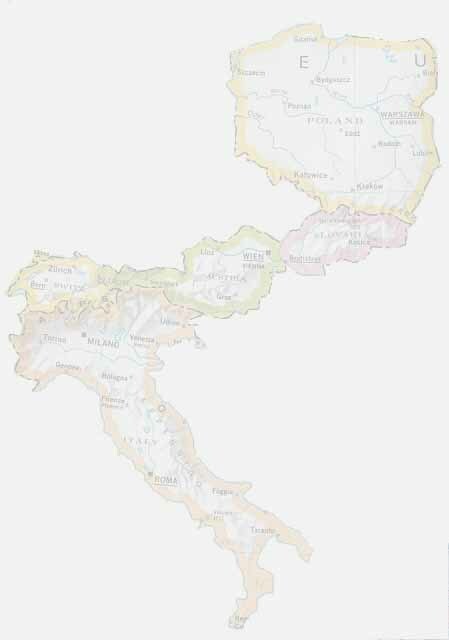 Click on any picture to see a larger version. 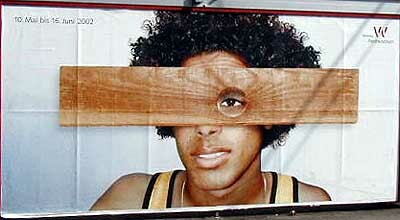 Use your browser's back button to return to this page. If you can read any of theses signs for which I have not provided translations, please email your translation to me, so that I can add it to this page. allen@assisi-downs.com Thanks. 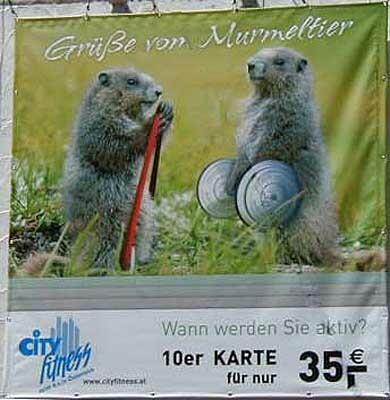 This ad caught my attention in Vienna. 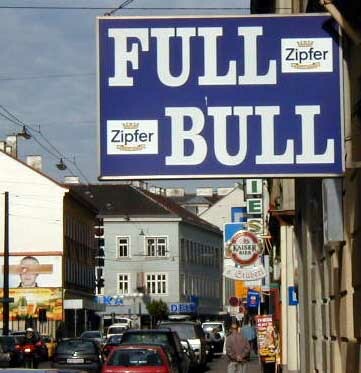 I don't know what they are selling. I found this one in Prato. I think this is selling some kind of beauty cure. 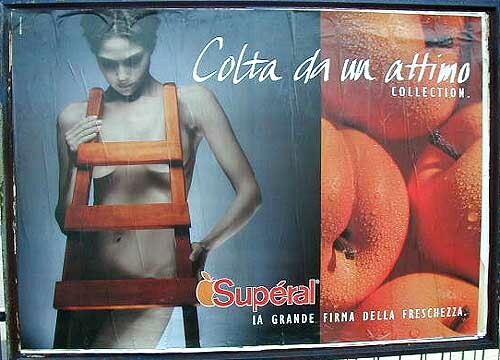 Also from Prato, this is a clothing ad I think, not a fruit ad. 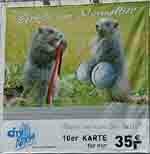 On the window of a shop in Scuol, this is a see-through ad, like those you see wrapped around buses and covering the windows. This one is from one of the Cinque Terre villages. 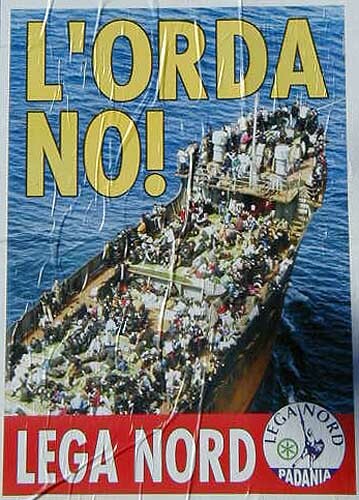 I think it deals with immigration, but I'm not sure which side of the issue it advocates. From a wall in Venice: Death to Israel - Free Palestine. Art: Destroyed buildings in Palestine. Artists: US and Israeli leaders. Instruments: Tanks, guns, and troops. This one is here only because it had my name in it. 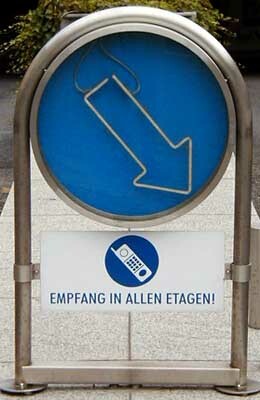 I assume it is telling you that your cellphone will or with not work in the parking garage. 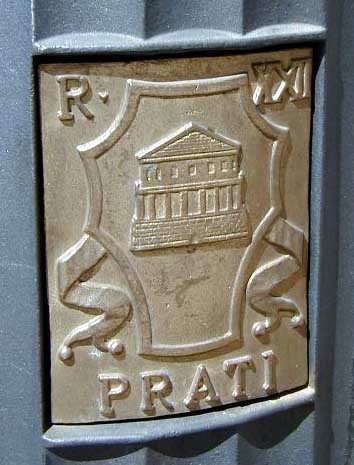 This symbol of the Prati district of Rome was on all the trashcans near the Vatican. 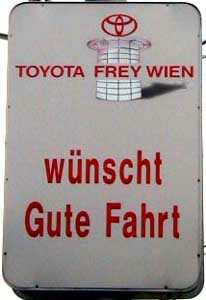 And extra fart on a trolley car in Zurich. 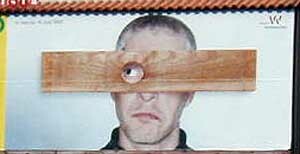 I'm not sure what this campaign was all about, but there were people peering through knotholes on billboards all over Vienna. 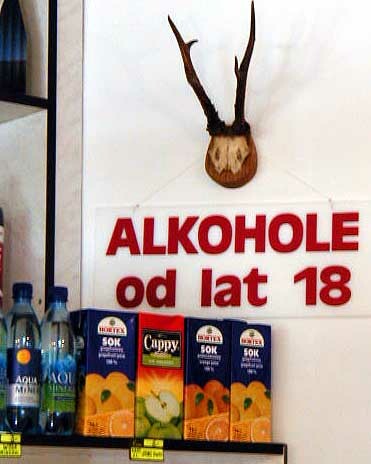 You must be 18 to drink alcohol in Warsaw. 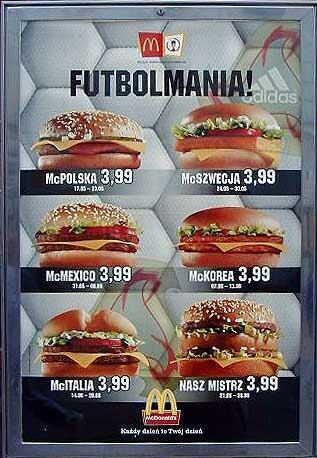 MacDonald's all over Poland carried this ad. The prices are in Zloty and there are about 4 Zloty to the dollar. From a Hot Dogi, Hamburgery, and Pizza shop in Kazimierz, Poland.